The increasing popularity of athletics sports events in the UK means there is a higher demand for good quality athletics surfaces, especially long jump and triple jump runways and sand pits. Schools and colleges are keen to get kids into different athletics events, and this means having safe facilities for them to practise on, so how can you make your long jump runway as safe as possible? It is important for you long jump or triple jump runway facility to have a high quality sand landing pit for the athlete to land on when they have completed their jump. 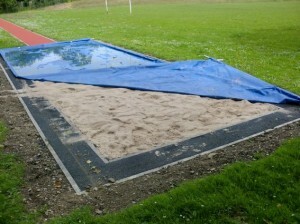 A good sand pit provides the best impact absorbing qualities to prevent injuries on landing and keep athletes safe. The standard IAAF dimensions for a long jump landing pit are 9m x 2.75m, however this can be tailored to your individual specification, for example it is unlikely that a primary school long jump facility would need a landing pit of that size. Although pre cast concrete (PCC) edgings are the most durable surface to have surrounding your long jump or triple jump sand pit, a safer option would be to install rubber safety kerbs which are softer and can absorb impact from trips or falls. We would advise installing these rubber safety edgings for facilities where safety is going to be the major concern, for example at schools and clubs where children will be using the surface. These rubber kerbs are made of recycled tyres so they are usually black and generally come in dimensions of 1200mm x 50mm x 155mm, however this can change depending on the size of your landing pit. Your organisation may be eligible to receive a funding grant to help with financing an athletics surfacing project, these grants can be made available to schools, colleges, and leisure centres etc. To check what funding grants you may be able to apply for, please check the funding grants website and search for grants to suit your organisation. We are specialist contractors in the construction and maintenance of athletics sports facilities and we would be happy to discuss any enquiries you have, please fill your details in using our contact form and we will get back to you with details of costs and quotes for your project. If you would like any further information regarding athletics facilities or any other sports surfacing construction, please visit our website at https://www.sportsandsafetysurfaces.co.uk/ where you can find examples of our previous work including installations of artificial grass pitches, multi use games areas, and play area surfaces. If you found this article useful, please don’t hesitate to leave a comment and share it, thanks!